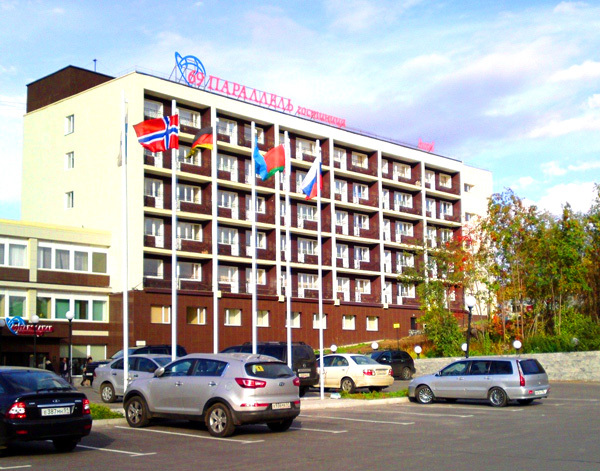 The hotel has been completely renovated during the period of 2010-2013. 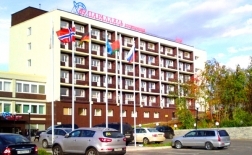 The hotel is located in the picturesque Cosy Valley (Valley Uyut) where international competitions in winter sports are held and it is only 8 minutes’ drive from the centre of Murmansk. Comfortable single room of 33 sq.m. with modern design, consisting of a hallway and a bedroom. A cozy room with an area of ​​15 sq.m. equipped with modern comfortable furniture, a TV, telephone and bathroom. A cozy room with an area of ​​20 sq.m. equipped with a double bed with bedside tables, wardrobe, desk, TV, telephone and bathroom. A cozy room with an area of ​​15 sq.m. equipped with modern comfortable furniture, LCD TV, telephone, refrigerator, and a bathroom with a heated floor. The cottage is a studio of 45 sq.m. with a bedroom area, a kitchen and a relaxation area, it has a sauna, electric fire with a living flame effect, cable TV, free internet, necessary equipment and utensils.